Heat management and management of extensive cable system are the major challenges which are arising due to present scenario of merging complex computer arrangements. Excellent planning and state of art designing is required for the heat and cable management as managing the discharge of heat from the cables is very important. Data center solutions which include heat management are based on primary methods incorporated with modern methods to optimize the cooling solutions for data center racks. A drastic increase has been observed in setting up of servers across various institutions all-round the globe and thus a huge increase in data center setups has been observed. With increasing setups of data centers, effective data center solutions are required. The size and number of the data centers have also seen a drastic rise. The number of servers can be up to thousands in large data centers that support a remarkably large number of users. Thus to manage these large data centers, perfect data center solutions and Data center management are needed. For effective data center solutions a lot of factors have to be considered. Some of the factors for perfect data center solution designs are cooling arrangements, heat dissipation, cable management and also effective power consumption. Apart from the above mentioned factors which play a crucial role in designing an effective data center solution and Data Center Racks, weight management is also a vital factor that must be considered in a data center. For the floor designers, it is always a challenge to manage the weight per square meter considering the static weight of the servers in the racks. Another major aspect is the cooling factor in complex equipment which is achieve with the use of perforations doors and thermal sealing which make sure that the hot and cool air don’t get mixed. 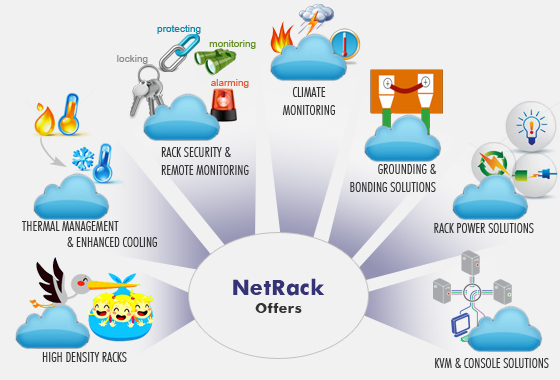 Rack manufacturers operate in unison with the PAC they together take a decision on rack and corridor solutions and the power supply at the rack so that more and more servers and equipment can be employed on the racks. The corridors provide any mixing of hot and cold air and thus prevent the short circuiting of hot and cold air. This mixing is prevented by providing doors at both ends of the cold aisle. Apart from the doors, all cabinets are provided with blanking panels, plinth and rack side thermal sealing so that the only way left for the cold air is through the equipment.